Cafe Scientifique is a place where, for the price of a cup of coffee or a glass of wine, anyone can come to explore the latest ideas in science and technology. Enjoy listening to a short talk from a guest speaker before engaging in debate and discussion around the topic. Find out more about the international sensation that is Cafe Scientifique by looking at their website. We run every first Tuesday of the month (with the odd exception) from 7.30pm – 9pm with doors open from 6.30pm. You don’t need to register for our events, just come along and enjoy yourself! Make sure you get here early for a good seat though as we fill up fast! This activity is recognised under the Global Talent Programme and allows attending students to gain credit towards their Global Talent Award. Pier Review: What does the future hold for British Seaside Piers? Victorian seaside pleasure piers are unique to the British coast but this is important part of the country’s heritage is under threat: in the early 20th century nearly 100 piers graced the UK coastline, but almost half have now gone. This session will chart the development of British seaside pleasure piers: from their beginnings as humble landing stages through to the ‘golden age’ of pier building. We’ll also be looking at the current rejuvenation of piers, like Bournemouth, and how they are embracing the future. 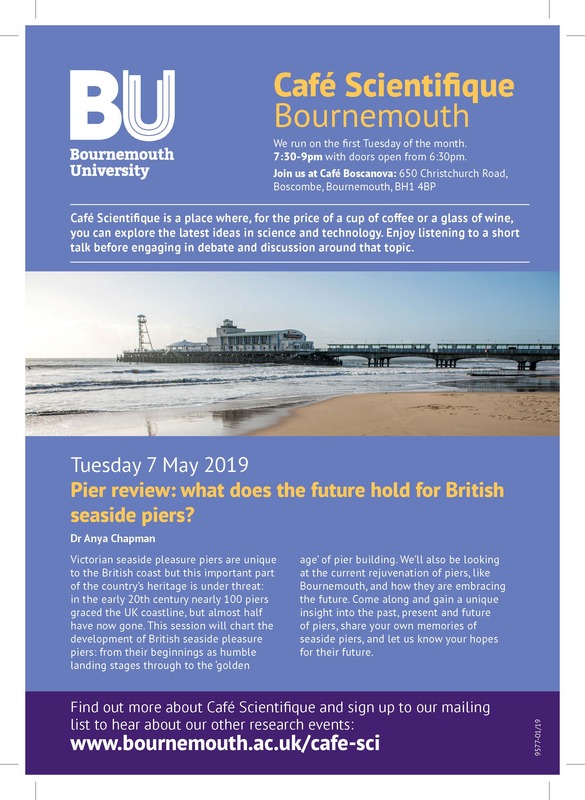 Come along and gain a unique insight into the past, present and future of piers, share your own memories of seaside piers, and let us know your hopes for their future. We run our event at Cafe Boscanova on Boscombe High Street – (650 Christchurch Rd, Bournemouth, BH1 4BP). There is free parking available after 6pm on the nearby Hawkwood road next to the Sainsbury’s as well as a regular bus timetable. If you’d like a monthly email reminder about our public engagement events, please complete the form below to subscribe to our mailing list. For more information about how your data will be stored and used, please see our privacy notice.